Flooding is a serious problem for any home or business owner. It is a terrible feeling to stumble upon a room that is below water! A flood at your home or business will cause many problems include damage to your belongings, furnishings, and possibly even the structure of the building. A quick reaction to deal with a flood and clean up the damage may help decrease the damage in the long run. However, in a crisis, such as flooding, it can be difficult to know what to do first. Here are our tips for how to deal with a flood at your home or business. Turn off the water. If the flood is a result of a leak in your home, always turn off the water first to prevent the flood water from rising. If the flooding is a result of natural causes such as rain, this will not be possible. In that case, you should take measures to block the flow of water into your property as much as possible. Call for back up. The next thing you should do is call for assistance. 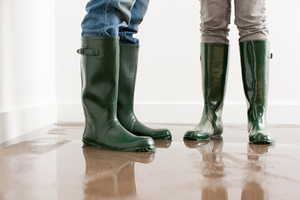 Cleaning up after a flood is a daunting task, and you don’t have to do it alone. Make an assessment of the damages. You will want to take a quick survey of the affected area in your home to see what damage has been done. This will help you as you prepare to contact your insurance company with questions about flood coverage and to file a claim. You can call us at AdvantaClean of West Knoxville 24 hours a day for emergency help when your home or business has flooded. Our staff can help with clean up and manage repairs to pipes or other issues that caused flooding.